I know going into this that I won’t be able to convert everyone, but I’m going to give it the old college try. For an old word nerd like me, The Glamour of Grammar is delicious. For those of you who are not obsessed with the difference between “than” and “then” (God forbid), this book is still palatable. In fact, it might even be more palatable. After all, everyone can benefit from improved writing skills at work, at home, online, you name it. Spelling, punctuation, grammar counts, people. It counts! Do you know the eight parts of a sentence? Noun, pronoun, verb, adverb, adjective, preposition, conjunction, and interjection. I was thrilled (remember, I’m a nerd!) to have the “different than| vs. “different from” issue be explained. I was almost giddy to have this clarified: Homonyms sound alike and are spelled alike but mean something different whereas homophones sound alike but are spelled differently and have different meanings. And when I learned this, I could only sigh with contentment: Contranyms are words that have opposite meanings, like sanction or cleave. The Glamour of Grammar is a wonderful book; it covers everything you need to know while still being readable, if you know what I mean. It packs a whole lot of information into a charming little book and doesn’t wind up sounding like a textbook. 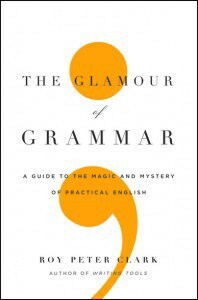 If you’d like to learn about (or master) compound and complex sentences, infinitives, similes, metaphors, and analogies — and tons more — get The Glamour of Grammar. Your professor, your co-workers, your readers will thank you! Most importantly, do it for yourself. Mastering good grammar is a valuable skill, one that is largely falling by the wayside. You have a great blog here. I’m glad I came across it. Everyone needs to learn or re-learn grammar.